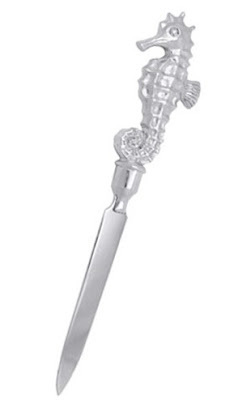 Our Embossed Seahorses Coastal Notes might be the perfect summer hostess gift paired with a Mariposa Seahorse Letter Opener. Seahorses Notes are white on the inside. 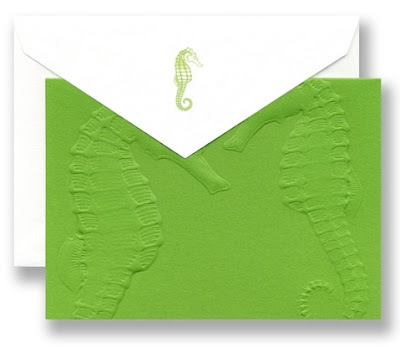 Envelopes feature a litho-printed seahorse motif. Sets of 10 notes + envelopes. Love both of these - what a perfect pairing. And yes, the absolute perfect hostess gift - especially for a weekend invitation at the beach!! Ohh, I love seahorses -- you always see crab, lobster and starfish motifs, but rarely a great seahorse!